It's hard to make folk and roots music stand out from the crowd. For some reason though, Canadian artists seem to have an affinity for it. The latest entry is the new new album from Toronto's Dog Is Blue. 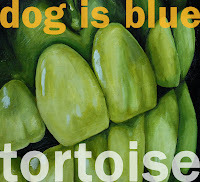 They release the sophomore album Tortoise on May 17th. This is much more of a band effort than the home recording of the debut. The result is a fuller sound with a new layer of warmth, often provided by the expanded use of backing vocals. The album opens with "Dusty Bones", an appropriate title for a dusty-style folker with a killer guitar breakdown. The arrangement on "Slow Boat To China" is choppy and wonky, but in a good way, hardly typical of folk music. Dog Is Blue even manages to make the banjo twinkle on "Southern Ontario". The strength of Dog Is Blue's music is undoubtedly the lyrics. Songs like "People" and "The Way It Goes" are crammed full of playful, if not cheeky, lyrics. Everything comes together in the perfect storm of "She Said". With it's 'whoo hoo hoo' refrain, it will be almost impossible to shake that ditty out of your skull. As far as making interesting music that's fun to listen to, Dog Is Blue are two for two. Dog Is Blue play Tranzac in Toronto on May 6th and June 9th. Best tracks: "She Said", "People"